He is an excellent cook specializing in bread, pies and superb desserts. He made these super delicious Cheesecake Bars for the family reunion dessert table along with half a dozen pies like pecan, cream and peaches and others. The pan emptied in a flash! He said I couldn’t use his name – although everyone in our very large family knows of his culinary expertise — half the population of three adjacent states. What’s a little more fame??? Especially when it comes to fabulous Cheesecake Bars! These are very easy to make so don’t let the rather long list of ingredients and directions intimidate you. Brother in law Chef chops the walnuts very fine, but I like a bit of texture so I stop chopping earlier while there are still pieces of nuts. I used a fork to cream the packed brown sugar and butter, then add the flour and nuts using the same utensil. A mixer makes the filling quickly. It will be the consistency of pudding when you pour it into the hot crust. The bars are even better the second day, if there are any left to hide in the refrigerator from the first fabulous taste on day one. The flavor deepens and the texture mellows if you can chill it for even a couple of hours before eating – but no one will judge if you just can’t wait that long. Add flour and chopped nuts and mix until crumbly. Set aside 1 cup of mixture for topping and press the remainder into the bottom of an 8x8 inch baking pan. In the meantime, blend sugar and cream cheese until smooth. Add egg, milk, lemon juices and vanilla and beat well. Spread over bottom crust and sprinkle with the 1 cup mixture reserved for topping. Return to oven and bake for additional 25 minutes, until crust is golden and filling firm. Cool and then chill thoroughly before cutting into bars. Recipe may be doubled and baked in a 9x13 inch pan. I’m so glad you stopped by today! Be sure to follow A Pinch of Joy so you don’t miss a thing! If you found this helpful or inspiring please share below! Your support of A Pinch of Joy is appreciated! 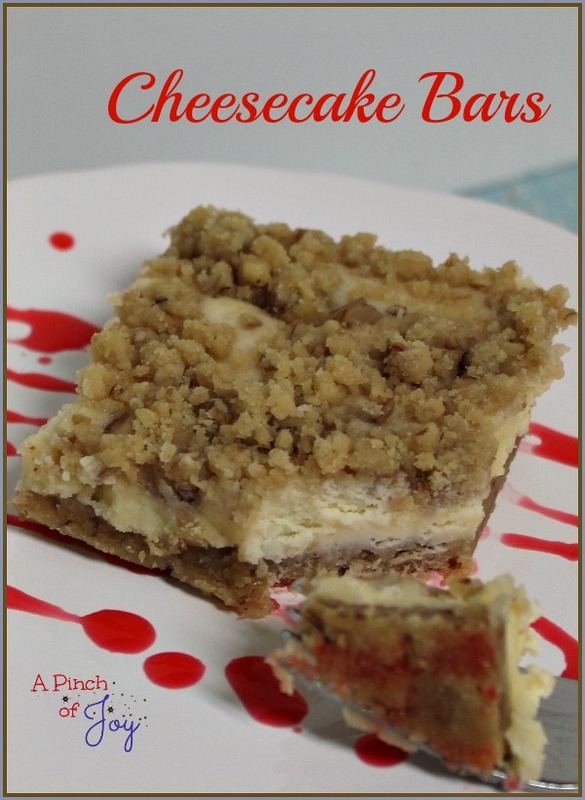 Your Cheesecake Bars look awesome! Thank you so much for sharing with Full Plate Thursday and have a great weekend!